Make that a triple espresso, if you would, with a cappuccino on the side. Oh, and I’ll take a large double double. Make mine to go, as well. More coffee means longer life. Can you blame me? Just when we believe the world is super-saturated with coffee, comes news that two scientific studies concluded coffee consumption is associated with a longer life expectancy. The studies involved some 750,000 people and conducted over a period of 16 years. In one study of Europeans, men that consumed coffee were 12% less likely to die during the study period than non-coffee drinking males. Women that drank coffee clocked in at seven per cent higher on the same scale. In the other study, in which the participants were US residents from different backgrounds, one cup a day drinkers were also 12% less likely to die, during the sixteen-year study. These findings are consistent with those of previous studies from the US, the Netherlands and Japan. One additional finding from the new US study was that the positive difference jumped to 18% for drinkers of more than one cup a day. That’s 50% better than the single cup group. If the finding holds, you’ll be able to argue not only that coffee helps prolong your life, but also that the more you drink, the more likely you are to live a longer life. Researchers aren’t yet buying this connection, mindful of the old statistical adage that correlation is not causation. It may rain every time you wear your blue shirt, but it doesn’t mean that wearing the blue shirt causes it to rain. What they do seem prepared to say is that people needn’t worry about the adverse effects of drinking coffee. 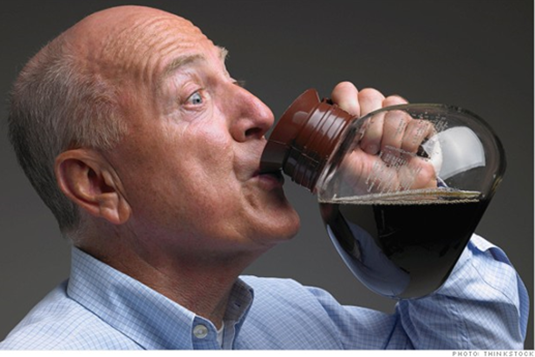 The party poopers at Health Canada (HC) worry about the downside of caffeine. As recently as this past May, the federal health agency warned, “Consuming too much caffeine can cause insomnia, headaches, irritability and nervousness.” HC recommended healthy adults limit their intake to the equivalent of three, 8-ounces cups of coffee a day; an extra-large Tims coffee is 24 ounces and thus your daily dose. Any suggestion that people hook themselves up for daily caffeine dialysis on the theory ‘the more the merrier’ is likely to face a bucket of cold water from the feds. Coffee is the good addiction, Aldous Huxley might say. As most of us can vouch from personal experience, coffee is a stimulant, a pick-me-up, but caffeine is also ostensible addictive. According to one source, Smithsonian.com, no less, coffee has similar properties to a chemical called adenosine, which when released in the brain induces tiredness. Caffeine, which has a similar molecular structure to adenosine, jumps into and blocks the receptors in the brain where the adenosine would normally move; the result is greater alertness and energy. This blocking, in turn, stimulates the production of dopamine and adrenalin, enhancing the stimulating, even relaxing effect of coffee. The brain responds by creating more adenosine receptors, thereby requiring you to ingest more coffee to achieve the same effect as you had before. Hence, you can become addicted to caffeine. In fact, I didn’t know, until I did a little research this week, that caffeine withdrawal is in the Diagnostic and Statistical Manual of Mental Disorders (DSM-4) as a mental disorder. The symptoms, which last about 7-to-12 days, are fatigue, headaches and throbbing pains, nausea and irritability. Chemically, the brain has become used to caffeine and its withdrawal is traumatic, although by the end of the withdrawal period the brain will naturally decrease the number of its adenosine receptors to pre-addiction levels. Coffee addiction is seductive. It’s so easy to become dependent on coffee and the downside doesn’t appear until you try to give it up. Yet, to call ourselves addicts is to diminish our stature in front of our mirrors. It’s better to call caffeine ingestion a habit instead; a good habit, on balance, that helps us to live longer. What will our great-great-grandchildren say about us? That we were hopeless caffeine addicts that stuck around too long. That we were wise centenarians who, despite our peculiar habit, found the secrets of longevity through science? Let’s stick around, somehow, to find out.